Dowel bars are short steel bars that provide a mechanical connection between slabs without restricting horizontal joint movement. They increase load transfer efficiency by allowing the leave slab to assume some of the load before the load is actually over it. This reduces joint deflection and stress in the approach and leave slabs. Dowel bars are typically 32 to 38 mm (1.25 to 1.5 inches) in diameter, 460 mm (18 inches) long and spaced 305 mm (12 inches) apart. Specific locations and numbers vary by state, however a typical arrangement might look like Figure 1. 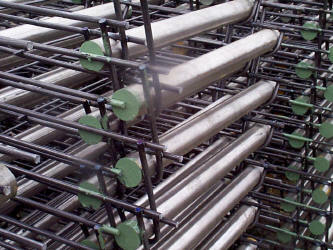 In order to prevent corrosion, dowel bars are either coated with stainless steel (Figure 2) or epoxy (Figure 3). Dowel bars are usually inserted at mid-slab depth and coated with a bond-breaking substance to prevent bonding to the PCC. Thus, the dowels help transfer load but allow adjacent slabs to expand and contract independent of one another. Figure 3 shows typical dowel bar locations at a transverse construction joint. Figure 3. Dowel bars in place at a construction joint- the green color is from the epoxy coating. 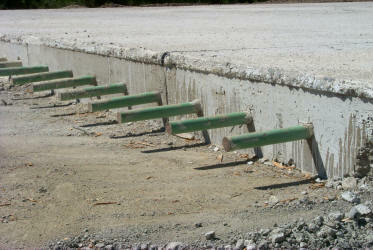 Do you utilize epoxy coated smooth dowels in your concrete pavements? Have you excavated smooth dowels from concrete pavements recently? If yes, what condition were they in generally? Have you experienced rusting problems with epoxy coated smooth dowels? If yes, about how long were they in place and was the rusting cause for pavement joint failure? Do you use smooth dowels that are not epoxy coated? If yes, what coatings do you use and what percentage of your smooth dowels are coated with something other than epoxy? Would you like a coy of the compiled results of this survey?